MLB’s attendance, you might have heard, was down last year, around four percent by season’s end. The league’s front office, represented by anthropomorphized wet blanket Rob Manfred, has operated under the assumption that pace of play is the issue, arguing that “putting the best entertainment product on the field” would bring attendance back up. There are of course other ways to explain such a drop in attendance, but those are topics Manfred doesn’t really want to broach in public. One issue is that more teams than ever are more willing than ever to put a non-competitive product on the field. 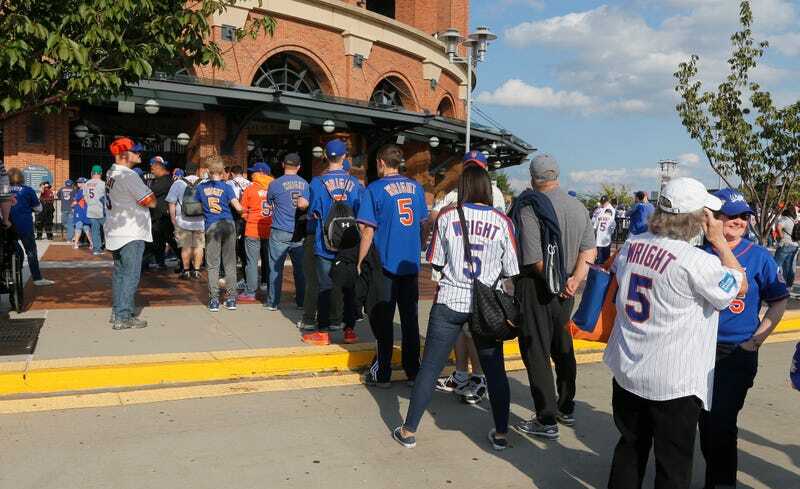 Another is that MLB teams across the country have ensured that the actual experience of attending a baseball game is increasingly laden with hassle and expense. The Nationals’ bag ban may not seem like a huge deal on its own—the Cardinals quietly implemented a similar rule in 2017, after all—but the cash grab here is brazen, and it’s just the latest in a slew of developments that promise to make MLB stadiums less hospitable to the very fans they are meant to entertain. If onerous security measures, overpriced tickets, and mediocre in-stadium sports bars presently define the experience of going to a baseball game, then the Rays are ready to show us yet another inconvenience that may help define the future. The Rays announced earlier this year that their stadium will be going completely cashless this season. Arguments for doing so tend to be forwarded on the premise that it makes purchasing items inside the stadium more secure, faster, and easier for customers. Rays Vice President of Strategy and Development, William Walsh, argued the change “will increase speed of service and reduce lines throughout the ballpark.” Even if we accept that the angry beep of the card reader and fumbling movements of newly-minted Apple Pay users will make lines move faster, it’s impossible to ignore the piece of the plan that comes dangerously close to straight-up scamming. Fans who still want to be able to use cash inside the stadium will have to use their dollars to purchase a Rays gift card, available in $10 or $20 increments only. This is a policy that near-expressly indicates a hope on management’s behalf that fans will either leave a balance on their card and have to come back to use it again, or scramble to spend extra money that they hadn’t originally planned on spending as the game comes to an end. An article in Venues Now, which includes numerous quotes from Walsh, posits two factors beyond transaction speed that may have played a role in the Rays’ decision: going cashless “also reduces employee theft, according to teams and vendors” (the article gives no proof for this bold claim), and “digital technology enables teams and concessionaires to gain more information about their customers to improve their experience and generate incremental revenue through upsells and promotions.” The promise of shorter concession lines is a great selling point to pitch to fans, but just as is the case with the proliferation of premium clubs, the real motivations behind the change have little to do with making fans happier. The Rays want their fans to spend more money while thinking less about how much they are spending, and they want the data necessary to upsell them in the future. It seems the practice will catch on: The home arena of the Atlanta Falcons and Atlanta United FC announced and adopted the policy shortly after the Rays did, and now the Mariners will have “cashless pay points” throughout their newly branded park this season. These sorts of changes and additions to the gameday experience may not be things that will routinely ruin anyone’s day at the ballpark, but they each exist as points in the same constellation that, when examined in its totality, reveals the overall experience of going to an MLB game to have been getting increasingly and subtly worse. Let’s imagine a family of four trying to go to a baseball game a few years from now. Opening Day, 2021: four tickets cost $132 on average in 2019, so let’s say this family paid $150 per ticket. Kids have little legs, so they will need to park close: add another $50. After struggling to bring up their e-tickets on a single phone at the gate (the team recently phased out all paper tickets), our family will be informed their backpack is a no-go, and they’ll have to spend $20 to rent a Binbox. Finally, after making it into the stadium, it’s time to buy food. Hot dogs and peanuts for four, plus beer and sodas for two each will likely crest $40, and that’s assuming the parents are okay with cans of cheap frat-party beer. (For a pour of the local microbrew, it will be more like $15 each. We’ll say the conscientious parents share one.) Our imagined family had better have their credit card, too, or else they’ll need to load their cash onto a gift card before buying anything in the stadium. Maybe they will be lucky enough to have access to the State Farm-Geico Rewards Club, which the e-ticketing app will remind them of along with directions to the team store. After meandering through the State Farm-Geico Rewards Club so as not to feel like they have missed out on any perks available to them, the parents limit their children to the choice of one $25 stunt food to split. When our family returns to their seats with their Mac and Cheese Pizza Nachos just after missing a home run, they will have already spent a small fortune. If they decide not to attend another game for the rest of the season, it’s unlikely that pace of play will be a determining factor. Does MLB Care If No One Cares?